This coffee maker comes in two different styles. The features presented here are for the more popular and less expensive pour-o-matic brewer. The unit brews 2 to 8 six ounce cups of coffee per batch very quickly. It features a convenient brew-pause feature allowing you to pour yourself a cup of coffee while the unit is still brewing. No need to wait for the complete brewing cycle to finish. Keep-warm function which preheats water for other beverages such as tea, hot chocolate, or soups. Included with your brewer is a deliming spring, two packs of filters, and an instruction booklet. The unit measures 14.25" x 6.75" x 13.5". You get a 1 year product warranty and a 3 year limited service warranty with this unit. 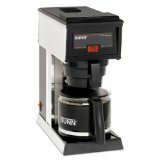 Like other Bunn brewers this is a very versatile, sturdy, and well designed coffee maker. After filling the water tank it takes about 15 minutes to preheat the water to brewing temperature. Once you have the water preheated you can brew coffee in 3 minutes just by adding more water. This unit can brew 2.7 gallons of coffee per hour. This is an 8 cup coffee maker with a space saving design that is designed to fit on any counter top. The decanter/carafe is included with this Black 120 volt coffee maker.